In large saucepan or Dutch oven, cook rigatoni to desired doneness as directed on package. Drain; return to saucepan. Cover to keep warm. Meanwhile, heat grill. In large bowl, combine eggplant, zucchini, bell pepper and onion. Add rosemary, lemon peel, garlic, salt, pepper, oil and lemon juice; toss to coat. Cut 24x18-inch piece of heavy-duty foil. Place vegetables in center of foil. Wrap packet securely using double-fold seals, allowing room for heat expansion. When ready to grill, place packet, seam side down, on gas grill over medium-high heat or on charcoal grill 4 to 6 inches from medium-high coals. Cook 8 to 10 minutes or until vegetables are tender, turning packet once halfway through cooking and adding tomatoes after 4 to 5 minutes of cooking time. Open packet carefully to allow steam to escape. 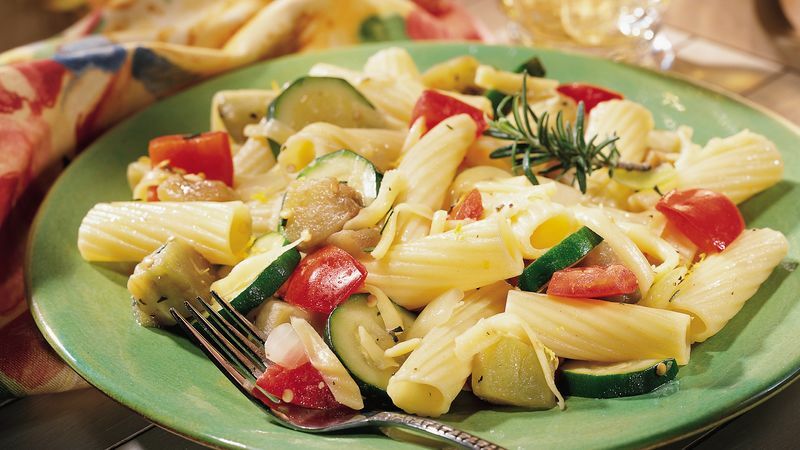 Add hot cooked vegetables to cooked rigatoni; toss gently to mix. Sprinkle with cheese. If desired, garnish with additional rosemary sprigs.